(USMagazine) -- Michael Jackson has been dead for almost four years, but peace still eludes him. 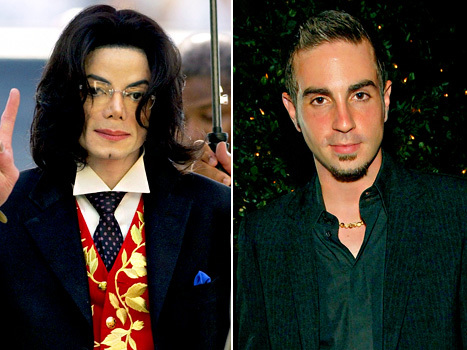 According to TMZ, the late singer has been posthumously accused of molesting Wade Robson, a choreographer who has worked with stars including Britney Spears, 'N Sync, Usher, and Pink. Per legal documents obtained by the site, Robson is asking for money from the Michael Jackson Estate for "childhood sexual abuse." After meeting Jackson when he was 5, the now 30-year-old dancer had several sleepovers at the pop icon's Neverland Ranch. These allegedly continued until he was 14. Robson previously testified during Jackson's 2005 molestation trial. At the time, he denied that the singer had ever molested him. However, TMZ reports that a member of Jackson's staff testified that she witnessed the two in the shower when Robson was 8 or 9 years old. Incidentally, Robson has paid homage to his former mentor several times over the years, both in dance and in words. In 2003, he choreographed an elaborate "Tribute to Michael Jackson" number on his MTV show, The Wade Robson Project. And after the singer's death in 2009, he released a statement expressing his sadness over the loss. "Michael Jackson changed the world and, more personally, my life forever. He is the reason I dance, the reason I make music, and one of the main reasons I believe in the pure goodness of human kind," Robson said. "He has been a close friend of mine for 20 years. His music, his movement, his personal words of inspiration and encouragement and his unconditional love will live inside of me forever. I will miss him immeasurably, but I know that he is now at peace and enchanting the heavens with a melody and a moonwalk." I have been a huge fan of Michael's since the age of 12; I am now 41. Throughout that time I have witnessed allegation after allegation aimed at him from, what I see as, jealous and money-hungry people. Anyone who knew Michael personally knew he was not capable of the atrocities that some have laid at his door. I sincerely trust that the courts treat this lawsuit with the contempt it deserves and put a halt to the victimisation of the most talented man I ever knew. I concur with his brother -Jermaine in his book when he states that it was due to people unable to cope with such a successful and talented black man.